Before launching an instance, make sure you own a lease. About how to create a lease, please see Reservations. Once your lease is started, you are almost ready to start an instance. But first, you need to make sure that you will be able to connect to it by setting up Key Pairs. In the navigation side bar, click Project > Compute > Instances to get to the Instances page. Click the Launch Instance button in the upper right corner. 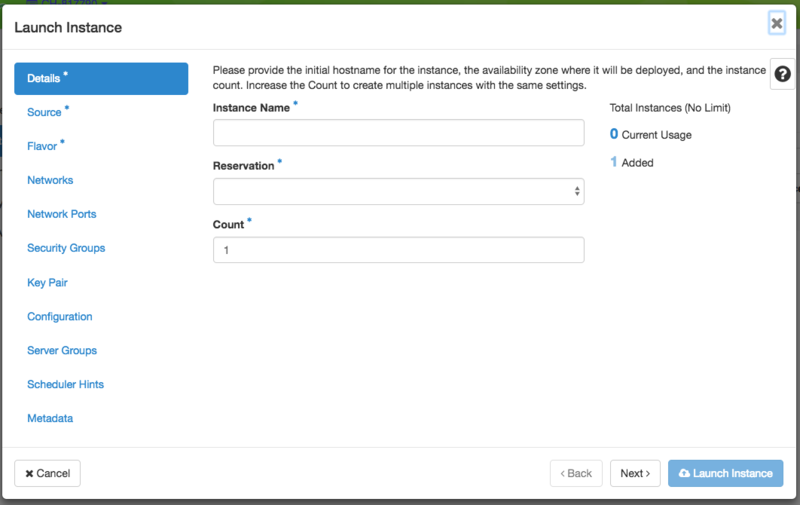 This will open the Launch Instance wizard with several configuration steps. Steps with * are required. In the Details step, enter a name for your instance that is unique within your project and select a currently active reservation for the instance. In the Source step, select an image for your instance and click the “up” arrow. The image should move to the Allocated list, and can be removed by clicking the “Down” arrow if you wish to select a different image. In the Flavor step, select the baremetal flavor by clicking the “up” arrow next to it. This is the only flavor available. If you are familiar with Openstack, other implementations allow for the selection of flavors based on machine disk size and RAM. On Chameleon, the only flavor available is “baremetal” because hardware selection is performed in reservations. In the Networks step, select a network by clicking the “up” arrow next to it. About Chameleon default network and how to create your own network, please see Networking. 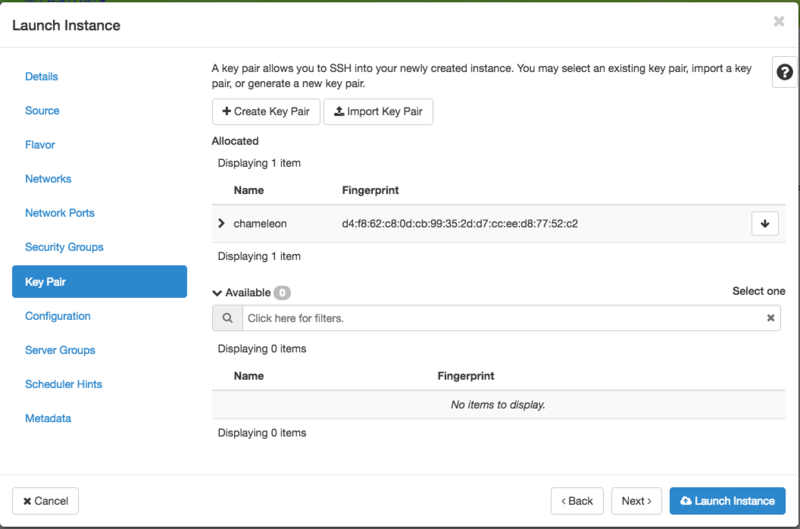 In the Key Pair step, select one of your SSH key pairs. If you only have one key pair associated with your account, then it is selected by default. It is a good practice to make sure that the instance is launching with the key pair of your choice, or you will not be able to access your instance. You may import or create key pairs directly through this step. 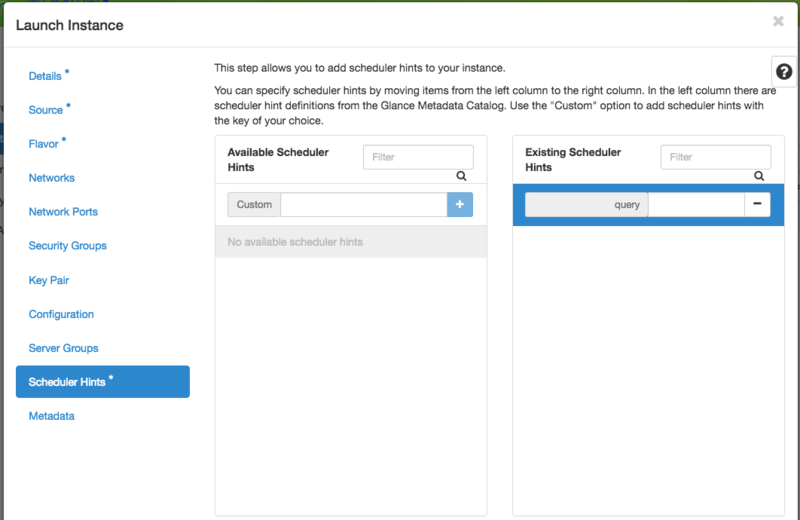 Optionally, you may configure Scheduler Hints. This is useful if you would like to launch an instance on a specific node in your multi-node reservation by UUID. In the Custom text box, type query and click the + button. This will add a query hint to the list on the right. In the query hint, enter your scheduler hint. For example, if you require a specific node, type ["=","$hypervisor_hostname","<node_uuid>"] where <node_uuid> is the node you are requesting. 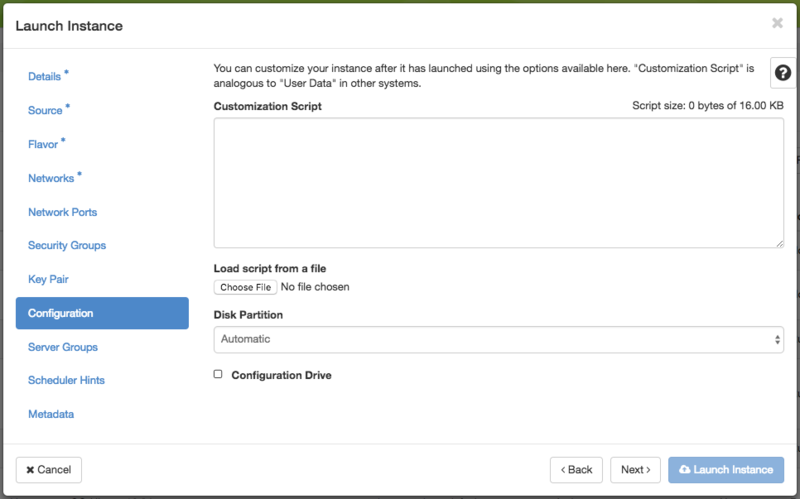 If you want to customize your instance after it has launched, you can add a customization script in the Configuration step. You can type in the script in Customization Script. Or you can upload your script via Load script from a file. You can disable and turn off appliance agents using a customization script. Finish configuring and start launching the instance by clicking on the Launch Instance button. The instance will show up in the instance list, at first in Build status. 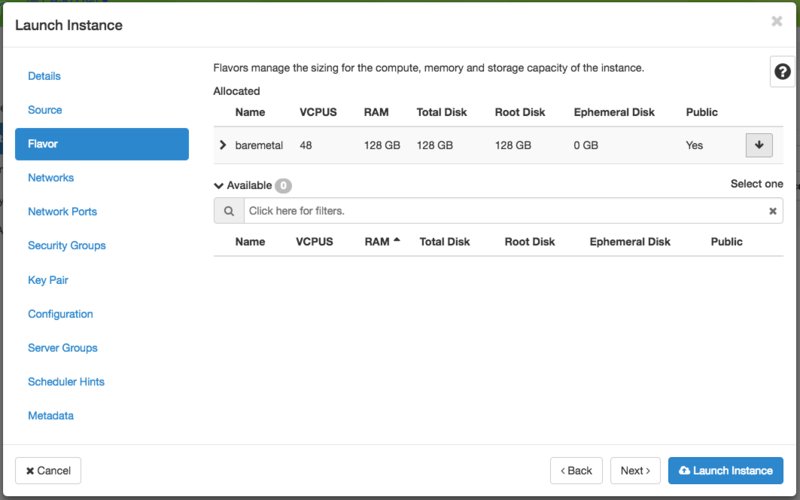 It takes a few minutes to deploy the instance on bare metal hardware and reboot the machine. After a few minutes, the instance should become Active. The power state will show as Running. You can now Associate a Floating IP. To view instance details, click on the instance. To make your instance publicly accessible over the Internet, you must associate a Floating IP Address to it. 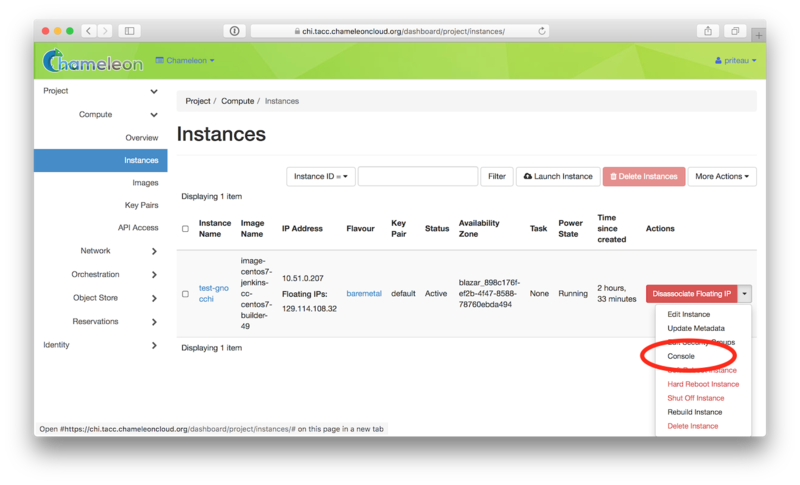 On the Instances page, click the Associate Floating IP button next to your bare metal instance. The following Manage Floating IP Assocations dialog will show. If you have previously allocated an IP address to your project that is not currently used, you may select it in the IP Address dropdown. Otherwise, click the + button to open the Allocate Floating IP dialog. In this dialog, you may simply click the Allocate IP button. The correct value for “Port to be associated” should already be selected. You may click the Associate button. You will be sent back to the instance list, where you can see the floating IP attached to the instance (you may need to refresh your browser to see the floating IP). Reading The Command Line Interface is highly recommanded before continuing on the following sections. You might want to automatically execute some code after launching an instance, whether it is installing packages, changing configuration files, or running an application. OpenStack provides a mechanism called User Data to pass information to instances. This information can be any data in any format, but if it is a shell script it will be automatically executed after boot by cloudinit. You can provide this shell script either via the web interface in the Configuration tab when launching an instance, or by providing a file to the nova command line using the --user-data option. Chameleon supported images are configured with appliance agents, including collectd and Heat agents. To turn off appliance agents on boot, in order to remove the potential impact on experimental measurements, pass the following script as user-data. Turning off collectd will stop collecting Gnocchi metrics, but you can turn on and configure the daemon anytime for monitoring your experiment. Before the February 2016 upgrade, support for kernel customizing on bare metal was limited due to the fact that instances were always booting their kernel directly using PXE and a common kernel command line. This required uploading kernel and ramdisk files to the Glance image repository as well as updating or creating a new OS image using these artifacts. However, it is now easy to customize the operating system kernel or modify the kernel command line. You now have the option of modifying the boot loader configuration (/boot/grub2/grub.cfg on CentOS 7 images) to point it to a new kernel on the local disk, or specifying kernel parameters and then rebooting using this modified configuration. To do this, you must be using a whole disk image rather than a partition image. Whole disk images contain their own kernel and ramdisk files and do not have kernel_id and ramdisk_id properties in the image repository, unlike partition images. For cloud computing and virtualization experiments, you might want to run virtual machines on bare hardware that you fully control rather than use the shared OpenStack KVM cloud. There are many different ways to configure networking for virtual machines. The configuration described below will enable you to connect your virtual machines to the Internet using a KVM Public Bridge which you must first configure manually on your host on the default network interface. Finally, start your virtual machine while assigning it the MAC address provided by OpenStack. If your image is configured to use DHCP, the virtual machine should receive the allocated IP. This will return a JSON dictionary describing site, cluster, and node. 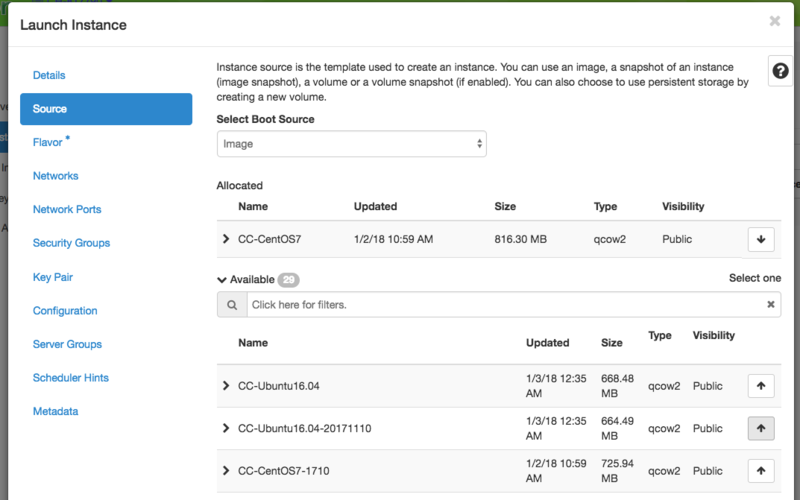 In its default configuration, the bare metal deployment system used by Chameleon (OpenStack Ironic) is restricted to using a single shared network per site. The network configuration features available in the dashboard are not supported (Networks and Routers). On CHI@UC, network layer 2 isolation is optionally available for compute nodes. You may find more details on the documentation for Networking. Once your bare metal instance has launched, you may interact with it by using SSH if you have associated a Floating IP to it or by using the Serial Console from the GUI. 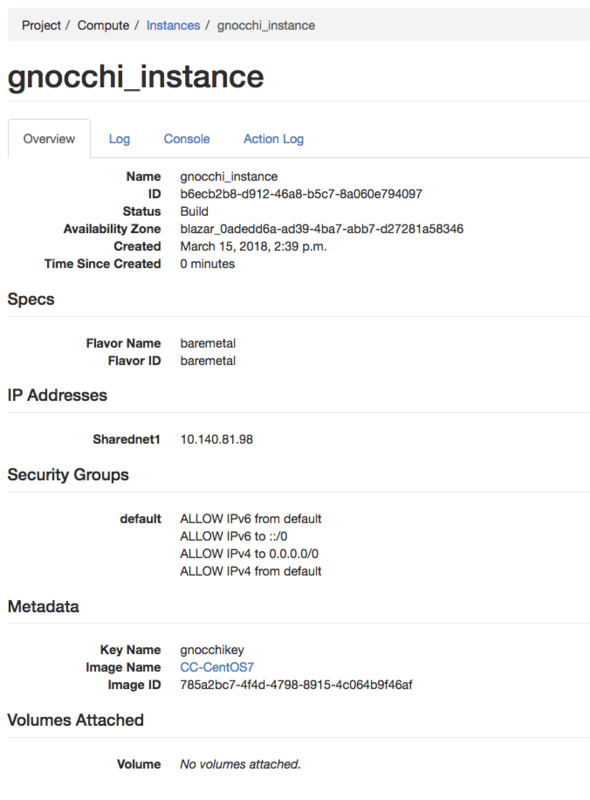 If you have associated a Floating IP with the instance and you have the private key in place, you should be able to connect to the instance via SSH using the cc account. It is likely that you have saved a previous entry for the instance’s Floating IP in your ~/.ssh/known_hosts file on your computer. Simply removing the entry from the file should solve the issue. The authenticity of host '130.202.88.241 (130.202.88.241)' can't be established. RSA key fingerprint is 5b:ca:f0:63:6f:22:c6:96:9f:c0:4a:d8:5e:dd:fd:eb. If you notice SSH errors such as connection refused, password requests, or failures to accept your key, it is likely that the physical node is still going through the boot process. In that case, please wait before retrying. Also make sure that you use the cc account. If after 10 minutes you still cannot connect to the machine, please open a ticket with our help desk. The cc-checks program prints the result of each check in green if it is successful and red if it failed. You can now run your experiment directly on the machine via SSH. You can run commands with root privileges by prefixing them with sudo. To completely switch user and become root, use the sudo su - root command. Chameleon now allows you to connect to the serial console of your bare metal nodes via the GUI. 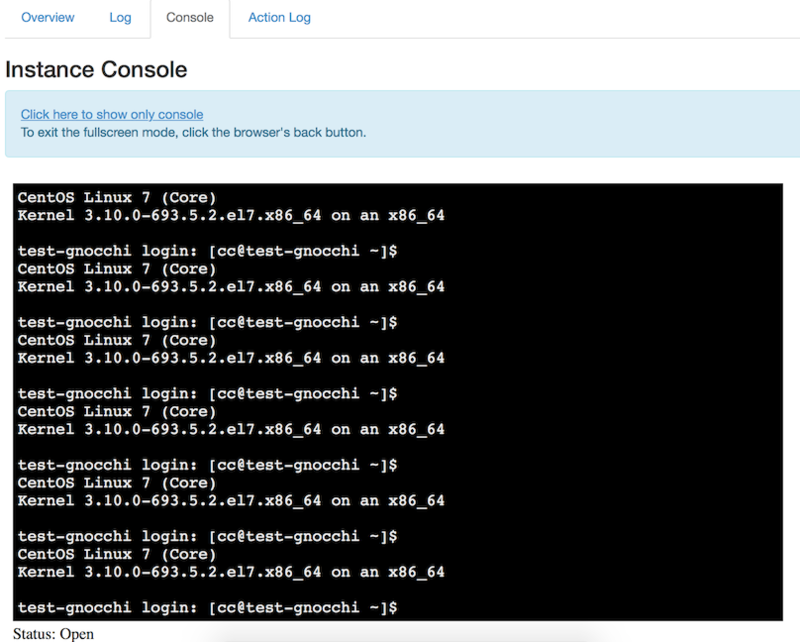 Once your instance is deployed, click on the Console button in the instance contextual menu. This should open a screen showing an interactive serial console (it could take some time to show up, give it 30 seconds or so). Our latest images are configured to auto-login into the cc account. Other images may show you a login prompt. You can set a password on the cc account by accessing it via SSH, using the command sudo passwd cc, and then using this password to connect to the console. © Copyright 2018, Chameleon Cloud Revision 56b9d360.